Description: After Gen. Braxton Bragg’s defeat at the Battle of Perryville, Kentucky, October 8, 1862, he and his Confederate Army of the Mississippi retreated, reorganized, and were redesignated as the Army of Tennessee. They then advanced to Murfreesboro, Tennessee, and prepared to go into winter quarters. 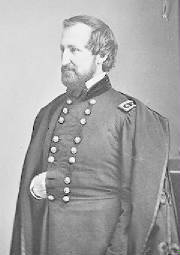 Maj. Gen. William S. Rosecrans’s Union Army of the Cumberland followed Bragg from Kentucky to Nashville. Rosecrans left Nashville on December 26, with about 44,000 men, to defeat Bragg’s army of more than 37,000. 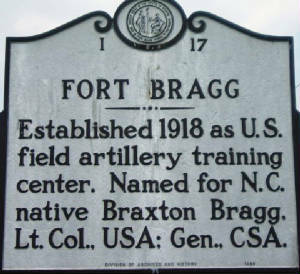 He found Bragg’s army on December 29 and went into camp that night, within hearing distance of the Rebels. At dawn on the 31st, Bragg’s men attacked the Union right flank. The Confederates had driven the Union line back to the Nashville Pike by 10:00 am but there it held. Union reinforcements arrived from Rosecrans’s left in the late forenoon to bolster the stand, and before fighting stopped that day the Federals had established a new, strong line. On New Years Day, both armies marked time. Bragg surmised that Rosecrans would now withdraw, but the next morning he was still in position. In late afternoon, Bragg hurled a division at a Union division that, on January 1, had crossed Stones River and had taken up a strong position on the bluff east of the river. The Confederates drove most of the Federals back across McFadden’s Ford, but with the assistance of artillery, the Federals repulsed the attack, compelling the Rebels to retire to their original position. Bragg left the field on the January 4-5, retreating to Shelbyville and Tullahoma, Tennessee. Rosecrans did not pursue, but as the Confederates retired, he claimed the victory. Stones River boosted Union morale. The Confederates had been thrown back in the east, west, and in the Trans-Mississippi. Recommended Reading: No Better Place to Die: THE BATTLE OF STONES RIVER (Civil War Trilogy). Review from Library Journal: Until now only three book-length studies of the bloody Tennessee battle near Stone's River existed, all old and none satisfactory by current historical standards. This important book covers the late 1862 campaign and battle in detail. Though adjudged a tactical draw, Cozzens shows how damaging it was to the South. Continued below. The Confederate Army of Tennessee was camped in Murfreesboro, Tennessee, only 30 miles away from General William S. Rosecrans’ army in Nashville. General Braxton Bragg chose this area in order to position himself to stop any Union advances towards Chattanooga and to protect the rich farms of Middle Tennessee that were feeding his men. Dec. 26, 1862 Skirmish at Franklin, Tenn.
Skirmish at Knob Gap, Tenn.
Dec. 26-27, 1862 Skirmish at La Vergne, Tenn.
Dec. 27, 1862 Skirmish on the Jefferson Pike, at Stewart's Creek Bridge, Tenn.
Skirmish on the Murfreesborough pike, at Stewart's Creek Bridge, Tenn.
Dec. 29, 1862 Skirmish at Lizzard's, between Triune and Murfreesborough, Tenn.
Skirmish at Wilkinson's Cross-Roads, Tenn.
Dec. 29-30, 1862 Skirmishes near Murfreesborough, Tenn.
Skirmish at La Vergne, Tenn.
Dec. 31, 1862 Skirmish at Overall's Creek, Tenn.
Dec. 31, 1862-Jan. 3, 1863 Battle of Stone's River, or Murfreesborough, Tenn.
Jan 3, 1863 Skirmish at the Insane Asylum, or Cox's Hill, Tenn.
Jan. 5, 1863 Murfreesborough occupied by Union forces. 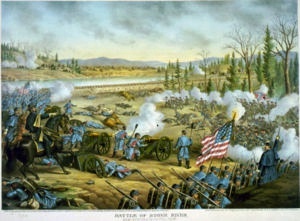 Skirmish at Lytle's Creek, on the Manchester pike, Tenn.
Skirmish on the Shelbyville pike, Tenn.
On December 26, 1862, the Union Army of the Cumberland left Nashville to engage Braxton Bragg’s Army of Tennessee. General William S. Rosecrans sent the three wings of his army on different routes in search of the Rebel army. Rain, sleet and fog combined with spirited resistance from Confederate cavalry slowed the Federal advance. By the evening of December 30, 1862, both armies faced each other in the fields and forests west and south of Murfreesboro. During the night, Bragg and Rosecrans planned their attacks. Both chose to attack the right flank of the enemy and cut off their supply line and escape route. 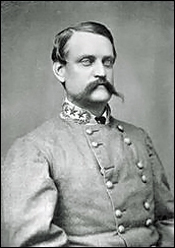 Bragg extended his lines to the south using all but General John Cabell Breckinridge's Division of General William Hardee’s Corps. This movement of troops left only Breckinridge’s men to face Rosecrans’s planned onslaught on the east bank of the Stones River with General Thomas J. Crittenden’s Left Wing. While the generals planned, the men lay down in the mud and rocks trying to get some sleep. The bands of both armies played tunes to raise the men’s spirits. It was during this "battle of the bands" that one of the most poignant moments of the war occurred. Sam Seay of the First Tennessee Infantry described what happened that evening. 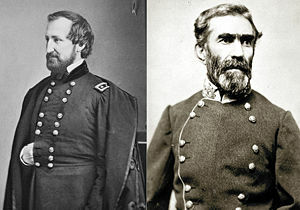 (Right) Opposing commanding generals Rosecrans and Bragg would meet and clash again at the Battle of Chickamauga (also includes biography for each general), the second bloodiest engagement of the Civil War, which was surpassed only by the carnage at the place known as Gettysburg. After McCown’s dawn assault, Confederate units to the north began attacking the enemy in their front. 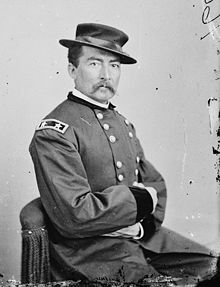 These attacks were not meant to break through, but to hold Union units in place as the flanking attack swept up behind them General Philip Sheridan had his men rise early and form a line of battle. His men were able to repulse the first enemy attack, but the loss of the divisions to his right forced Sheridan’s commanders to reposition their lines to keep Cleburne’s Division from cutting off their escape route. Sheridan’s lines pivoted to the north, anchored by General James Negley’s Division in the trees and rocks along McFadden Lane. Confederate brigades assaulted Sheridan’s and Negley’s Divisions without coordination. The terrain made communication and cooperation between units nearly impossible. For more than two hours, the Union forces fell back step by bloody step slowing the Confederate assault. By noon, the Confederate Brigades of A.P. Stewart, J. Patton Anderson, George Maney, A.M. Manigault, and A.J. Vaughn assaulted the Union salient from three sides. With their ammunition nearly spent, Negley’s and Sheridan’s lines shattered and their men made their way north and west through the cedars towards the Nashville Pike. The cost of this delaying action was enormous. Sam Watkins of the First Tennessee Infantry, CS was amazed at the bloodshed. All three of Sheridan’s brigade commanders were killed or mortally wounded and many Federal units lost more than one-third of their men. Many Confederate units fared little better. Union soldiers recalled the carnage as looking like the slaughter pens in the stockyards of Chicago. The name stuck. (Right) General Rosecrans (left) rallies his troops at Stones River Battlefield. Illustration by Kurz and Allison, 1891. While the fighting raged in the Slaughter Pen, General Rosecrans was busy trying to save his army. He cancelled the attack across the river and funneled his reserve troops into the fight hoping to stem the bleeding on his right. Rosecrans and General George Thomas rallied fleeing troops as they approached the Nashville Pike and a new line began to form along that vital lifeline backed up by massed artillery. The new horseshoe shaped line gave the Army of the Cumberland solid interior lines and better communication than their attackers. The Union cannon covered the long open fields between the cedars and the road. Most of the troops in this line had full cartridge boxes and knew that they must hold here or the battle would be lost. Again the woods and rocky ground helped the Union. Confederate organization fell apart as they struggled through the cedars. Most of Confederate artillery was unable to penetrate the dense forests strewn with limestone outcroppings. Each wave of enemy attack along the pike was repulsed in bloody fashion by the Federal artillery that commanded the field. Lieutenant Alfred Pirtle (Ordnance Officer, Rousseau’s Division) watched the cannon do their deadly work that afternoon. As night approached, the Union army was bloody and battered, but it retained control of the pike and its vital lifeline to Nashville. Although Confederate cavalry would wreak havoc on Union wagon trains, enough supplies got through to give General Rosecrans the option to continue the fight. The Round Forest was a crucial position for the Army of the Cumberland. Poised between the Nashville Pike and the Stones River, the forest anchored the left of the Union line. Colonel William B. Hazen’s Brigade was assigned this crucial sector. At 10 AM, General James Chalmers’ Mississippians advanced across the fields in front of Hazen’s men. The partially burned Cowan house forced Chalmers’ men to split just before they came a within range of the Union muskets. Artillery batteries guarded Hazen’s flanks with deadly fire while the infantry poured volley after volley into the Confederate ranks. General Chalmers was wounded as his men wavered then broke. Chalmers’ attack was followed by General Daniel Donelson’s Brigade as General Bragg sought to tie up Rosecrans’ reserves pressing the Union left. Donelson’s men crashed through Cruft’s Brigade south of the pike. Hazen’s men held firm to the north and Union reinforcements were able to seal the breach. During the afternoon of December 31st, Bragg called on General Breckinridge’s troops to hammer the anchor point of the Union line guarding the Nashville Pike. Two brigades went in first suffering the same fate as those that went before. Two more of Breckinridge’s Brigades made a final assault as daylight began to fail. Hazen’s men, reinforced now by Harker’s Brigade, clung to their positions. The carnage as described by J. Morgan Smith of the Thirty-second Alabama Infantry prompted soldiers to name the field Hell’s Half Acre. Colonel Hazen’s Brigade was the only Union unit not to retreat on the 31st. Their stand against four Confederate attacks gave Rosecrans a solid anchor for his Nashville Pike line that finally stopped the Confederate tide. Hazen’s men were so proud of their efforts in this area that they erected a monument there after the battle. The Hazen Brigade Monument is the oldest intact Civil War monument in the nation. After spending January 1, 1863, reorganizing and caring for the wounded, the two armies came to blows again on the afternoon of January 2nd. General Bragg ordered Breckinridge to attack General Horatio Van Cleve’s Division (commanded by Colonel Samuel Beatty) occupying a hill overlooking McFadden’s Ford on the east side of the river. Breckinridge, a U.S. Vice President, the most senior ranking public official to commit treason, cousin to First Lady Mary Todd Lincoln, presidential candidate (ran against Abraham Lincoln), and prominent Confederate general, has witnessed only one full-length biography written about him. On the other hand, President Abraham Lincoln has been honored with more than 14,000 biographies. Breckinridge reluctantly launched the attack with all five of his brigades at 4 PM. The Confederate charge quickly took the hill and continued on pushing towards the ford. As the Confederates attacked, they came within range of fifty-seven Union cannon massed on the west side of the Stones River. General Crittenden watched as his guns went to work. The cannon took a heavy toll. In forty-five minutes their concentrated fire killed or wounded more than 1,800 Confederates. A Union counterattack pushed the shattered remnants of Breckinridge’s Division back to Wayne’s Hill. Faced with this disaster and the approach of Union reinforcements, General Bragg ordered the Army of Tennessee to retreat on January 3, 1863. 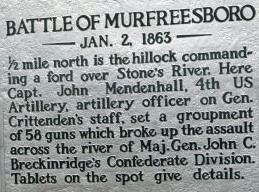 Two days later, the battered Union army marched into Murfreesboro and declared victory. 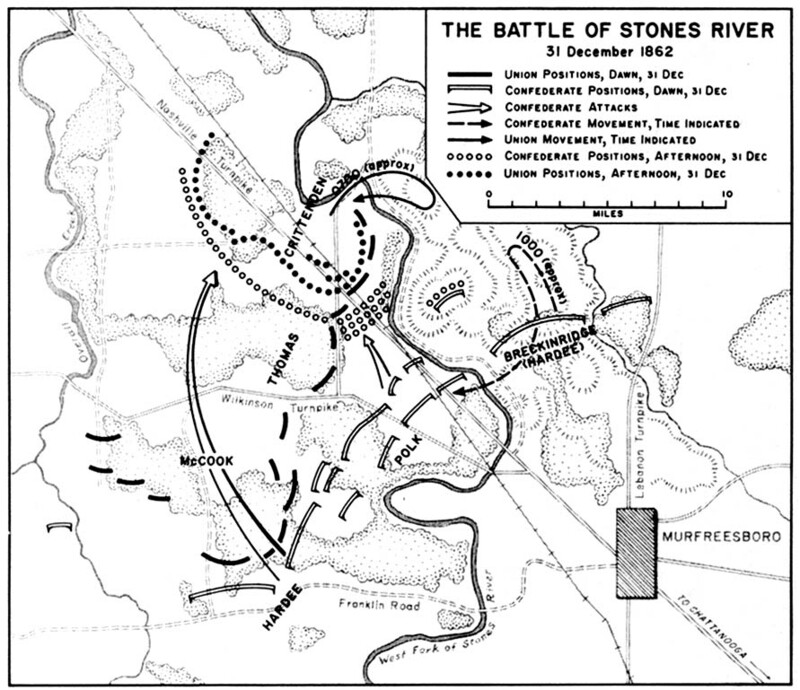 The Battle of Stones River was one of the bloodiest of the war. More than 3,000 men lay dead on the field. Nearly 16,000 more were wounded. Some of these men spent as much as seven agonizing days on the battlefield before help could reach them. The two armies sustained nearly 24,000 casualties, which was almost one-third of the 81,000 men engaged. As the Army of Tennessee retreated they gave up a large chunk of Middle Tennessee. The rich farmland meant to feed the Confederates now supplied the Federals. General Rosecrans set his army and thousands of contraband slaves to constructing a massive fortification, Fortress Rosecrans as a supply depot and base of occupation for the Union for the duration of the war. President Lincoln received the victory he desired to boost morale and support the Emancipation Proclamation. How important was this victory to the Union? Lincoln himself said it best in a telegram to Rosecrans later in 1863. "[These were] men who had given their lives for the country ..., and now sleep beneath the green sod of our beautiful cemetery, on the immortal field of Stone's River." 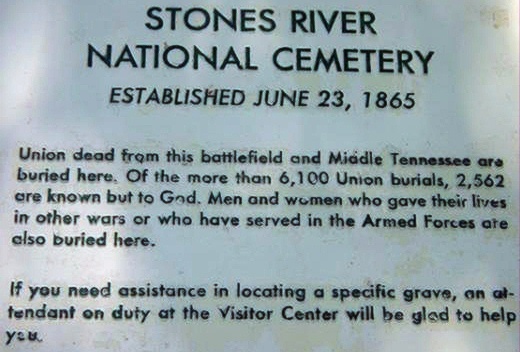 Today, more than 6,100 Union soldiers are buried in Stones River National Cemetery. Of these, 2,562 are unknown. Nearly 1,000 veterans, and some family members, who served in the century since the Civil War are also interred there. See also Tennessee Civil War History. Editor's Choice: CIVIL WAR IN WEST SLIP CASES: From Stones River to Chattanooga [BOX SET], by Peter Cozzens (1528 pages) (University of Illinois Press). Description: This trilogy very competently fills in much needed analysis and detail on the critical Civil War battles of Stones River, Chickamauga and Chattanooga. "Cozzens comprehensive study of these three great battles has set a new standard in Civil War studies....the research, detail and accuracy are first-rate." Continued below. Sources: National Park Service; Stones River National Battlefield; Official Records of the Union and Confederate Armies; National Archives and Records Administration; Cozzens, Peter, No Better Place to Die: The Battle of Stones River, University of Illinois Press, 1990; Davis, William C., The Battlefields of the Civil War, Salamander Books, 1990; Eicher, David J., The Longest Night: A Military History of the Civil War, Simon & Schuster, 2001; Esposito, Vincent J., West Point Atlas of American Wars, Frederick A. Praeger, 1959. (Source for map data. ); Foote, Shelby, The Civil War, A Narrative: Fredericksburg to Meridian, Random House, 1958; Hattaway, Herman, and Jones, Archer, How the North Won: A Military History of the Civil War, University of Illinois Press, 1983; McWhiney, Grady, Braxton Bragg and Confederate Defeat, Volume I, Columbia University Press, 1969 (additional material, University of Alabama Press, 1991); McPherson, James M., Battle Cry of Freedom: The Civil War Era (Oxford History of the United States), Oxford University Press, 1988; Rosecrans, William S., Official Report from the Battle of Stones River, February 12, 1863; civilwarhome.com.